Spice Odyssey: Exploring the Burning Tongues of Saturn. : Who's up for some hot sauce? Who's up for some hot sauce? The hot sauce taste test. The Spice must flow....................Just not from our arses. HOPEFULLY THIS GETS TO YOU!! WE HAVE THIS EXCELLENT ASIAN MARKET RIGHT ACROSS THE HIGHWAY.......THATS WHERE WE GET MOST OF OUR SPICES.....STOP N SHOP HAS A PRETTY GOOD SELECTION AS WELL AS WEGMANS LIKE YOU SAID!! IF YOU LOOK AT MY MYSPACE PIX, I HAVE A LAZY SUSAN THAT HAPPILY DISPLAYS ALL OUR FAVS! YOU SHOULD SEE OUR DRY SPICE CABNIT!! I HAVE NEVER SEE ANYONE TAKE IN AS MUCH STRAIGHT SHOTS OF HOT SPICE LIKE YOU!!! MY FRIEND MATT DID ONCE OF TABASCO, THE REGULAR KIND...AND I THINK I SAW EVER PORE OPEN UP ON HIS FACE AND SWEAT IN ONE BIG GUSH....PRETTY FUNNY STUFF!!! ILL LET YOU KNOW OF ANY THINGS YOU HAVENT POSTED THAT I SEE ON MY FOOD ADVENTURES!! There are four stages, if you will in the Spice Odyssey. These four stages represent how many Scoville Units will either send a person to the Spice Moons and beyond or will have them burning up upon re-entry. 1. Spice Camper: Unflinching in their resolve to never leave the safe gravity of ultra-mildom. Should a fleck of Cayenne pass the frontier that is their mouthes it could set off a wild fire that can only be quenched by loud complaining and derision of those who put forth this ungodly heat. 2. Spice Cadet: Ever the adventurer in their own minds. 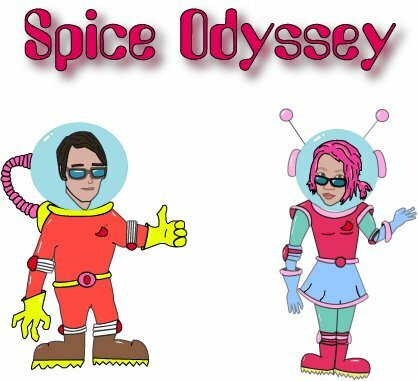 Spice Cadets, although ill-equipped to handle the rigors of Spice Travel, they will venture with you to the Thai Food Nebula. You'll make certain to ask for the robo-mild curry, but it most certainly will still be beyond their levels of Spicy-G force tolerance. But, how they try, how they try. They will seldom leave orbit and will always attempt to find a spice helmet that fits. The Spice Cadets spirit is to be commended. 3. Spice Invader: A Spice Invader will pillage and plunder the SPice Universe at will. Their reckless sense of adventure often gets them in over their heads. A Spice Invader may for instance, insist on venturing too close to a Vindaloo Black Hole from which their can be no return. "In Spice Space no one can hear you scream." You will often find them in zero gravity restrooms blowing out o-rings. 4. The Overlords, Masters of Spice and Thyme: These creatures are not of this universe. They are consumed by Spice Madness and will stop at nothing to dominate and conquer all things spicy. They have completely obliterated their palates. Never ask a Spice Overlord "is that very spicy?" It's your doom if you do. Curiously, Spice Overlords do not flock together. No, they are far too territorial. If two of these beasts should occupy the same space a great spice battle will ensue until there is nothing but charred wreckage and a single true Overlord. You will notice them by the sweat streaming from seemingly endless pores, and yet they will insist that they are "just fine." The Official Spice Odyssey T-shirts. All proceeds go to BiBi. We're Steph n Matt. We do retarded things to entertain ourselves. We have hilarious and cute dogs that we gush about. We discuss their poo on a daily basis, we're terrible. We are on opposite ends of the Spicy Food enjoyment scale. This blog is dedicated to peeps like us who try to coexist in a spicy world. Spicy Japanese Eats? Are you Serious? If you dip Chip into Salsa, it's really tasty.